Our fun and functional furniture is sized just for toddlers and preschoolers! Give pint-sized kids the ideal pint-sized comfy spot to curl up with a favorite stuffed animal, book, game, or activity – a cozy place they can call their own! Sturdy construction and quality materials make this furniture that will last. Available in several colors and fabrics to fit any with any home décor. 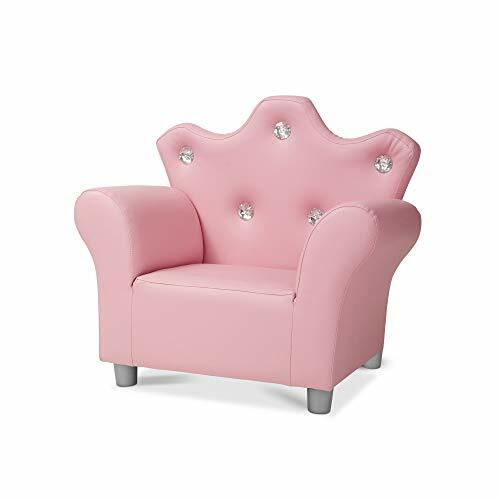 This children’s armchair is made from pink faux leather and can be paired with other Melissa & Doug furniture made from similar fabrics and colors. Our child’s comfy chair is sized for kids 3 and up and holds up to 100 pounds. The Melissa & Doug Child’s Crown Armchair is a great housewarming or baby shower gift for new parents. Add the Melissa & Doug Crown Sofa to give kids their own full furniture set. COMFY KID-SIZED ARMCHAIR: The Melissa & Doug Child's Crown Armchair is a comfy and quality-built chair for toddlers and preschoolers. This Amazon-Exclusive armchair is sold in pink faux leather. IDEALLY SIZED FOR KIDS: Our child's comfy chair gives kids 3 and up (holds up to 100 lbs) the ideal comfy spot to curl up with a favorite stuffed animal, book, game, or activity. STURDY CONSTRUCTION: The Melissa & Doug child's reading chair is made from high-quality materials and assembled with sturdy construction, which ensures the furniture will last against constant use. GREAT HOUSEWARMING PRESENT: The Melissa & Doug Child's Crown Armchair is a great housewarming or baby shower gift for new parents. Add the Melissa & Doug Crown Sofa to give kids their own full furniture set.